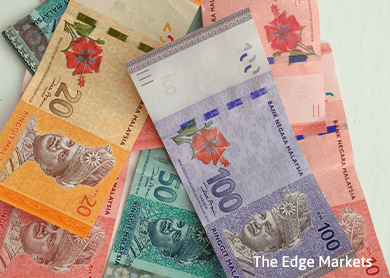 KUALA LUMPUR (July 28): For the past three weeks, Malaysian authorities have allowed the ringgit to trade below levels that in 1998 prompted them to impose a dollar peg and capital controls. Economists expect more downside, with the Federal Reserve set to raise U.S. interest rates. The ringgit has traded around 3.81 per dollar since July 6, exceeding the 3.80 level of the peg set by the government between 1998 and 2005. Economists warn against intervention to shore up the ringgit, as Malaysia's international reserves have already dropped to near five-year lows of $100.5 billion, data released by the central bank last week shows. While that is sufficient to fund 7.9 months of retained imports, it is just 1.1 times short-term external debt. The ringgit has fallen against the dollar since the third quarter of last year as weak energy prices threaten Malaysia's oil-and-gas revenues. Political uncertainty arising from the investigations surrounding debt-laden state fund 1Malaysia Development Bhd has further hurt sentiment. Foreign investors were net sellers of shares on the Malaysian bourse for 13 weeks until July 24. The central bank's governor said in January - when the ringgit was around 3.550 per dollar - that the authority had "moved on" from using controls to manage capital flows. The ringgit has declined 5.1 percent since then. A U.S. interest rate hike this year would spur further capital outflows from emerging markets such as Malaysia, pressuring the currency. "You can try to stabilise the ringgit, but ultimately I don't think it can stand the correction," said Chua Hak Bin, Singapore-based head of emerging Asia economics at Bank of America Merrill Lynch. "The ringgit will have to adjust to whatever new equilibrium... we are forecasting the ringgit to weaken to 3.86 by end-2015 and 4.05 by end-2016 against the dollar."